I hate to ask but I'm a bit confused by some of this. I just bought a 6 lamp T5HO system (72" over a 125g) and I wonder if I can keep a clam in it. I think by reading through this I might be ok if the clam is higher up in the tank. Is that right? The configuration of the bulbs is (12x39) 2 purple, 2 white and 8 blue lamps. I'm thinking I might need to exchange one of the blue for another 10k? Listen. I'm not going to pretend I'm an expert here, because I'm far from it. But 12 years ago when PC were all the rage, I had a maxima under PCs for almost 5 years. He went with the tank when I sold it off. Granted his growth rate potentional probably wasn't realized, he did thrive. Granted that's a lot of firepower in terms of PCs and atypical of what one would usually do, but it did work. This day and age though, there's no reason to go through all that. Can't wait to get me another! If I come across a nice maxima one day can I keep it in my 75g with 2 Kessil a350w's? i am wanting a clam...an want to keep something other than brown or green. so I am looking at a 3 to 4 inch Maxima. i have a standard 120 gallon, 30 inches deep powered by 2 250 watt metal halides with Phoenix 14k DE bulbs. Would a maxima be able to survive with this amount of light? would a Deresa be a better option? 30 inches is stretching it in my opinion. A deresa would be a better option, but each clam is different. I have a 30" deep tank and Im using maxspect razors (16k) and he's growing rapidly! Hes on the bottom of the tank sitting right on the crushed aragonite. What type of clam, Maxima? If you dont mind could you give your lighting schedule as well. I'm running the same light and have concerns as to went went wrong. I had a maxima that I could not seem to get settled or make happy and my tank is only 12" deep, maybe too much light or not properly acclimated. I am not a pro so excuse me if I'm wrong. small maximas will need live rock or a solid surface to attach (byssal threads) to. Does anyone have any experience with any type of clam (although I would prefer a maxima) with Ecotech radion pro30w I also have one kessil 700? I would be keep the clam aroind 24" deep but could move it up. I have 5 radions and one kessil. I have two Kessil AP700 over my 180. My new Maxima clam is just a few inches from the sand. I have taken PAR readings and his area should receive at least 250 PAR, probably closer to 300 and 70% for 7 hours. I don't plan to move it much I think it will receive all the light it needs where it is. Day 1: just a few hours after adding. I have 2 T. Max and 1 Deresa under four AI hydra52 on the bottom of a standard 120. They are all growing and opening just fine. I run my lights at about 60 power. Beware the light at the end of the tunnel. Sometimes it's a train. Is there a minimum tank size recommendation for tridacna maxima clams for water parameter stability? That greatly depends on your experience, and how much time / equipment you have for automation and stable water parameters. I get about 175 PAR at the gravel in my 30" tall tank. Has sufficed to grow a squamosa from 4 to 14 inches in a little over 3 years. Maximas I have grown higher up at about 300 PAR. All LED. 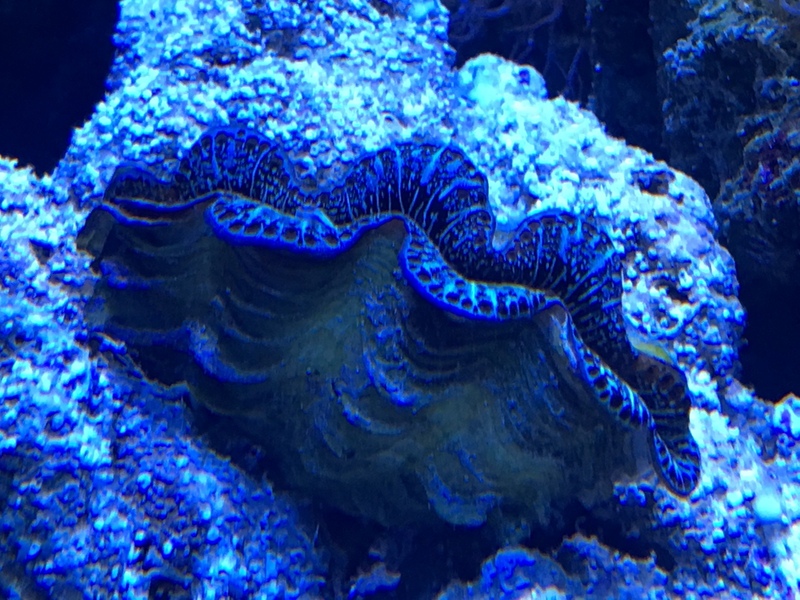 My wife is really into blue in the tank so I was thinking of adding a blue squamosa when the tank is fully mature. I have a standard 90 gallon, 2" sand bed so 22" deep with two radios Xr15w pros. Will this be enough lighting for the clam? Current Tank Info: 90 gallon reef. Biocube 29 lionfish tank. Mantis tank.